Our readers have spoken. Here are the winners from our annual survey. 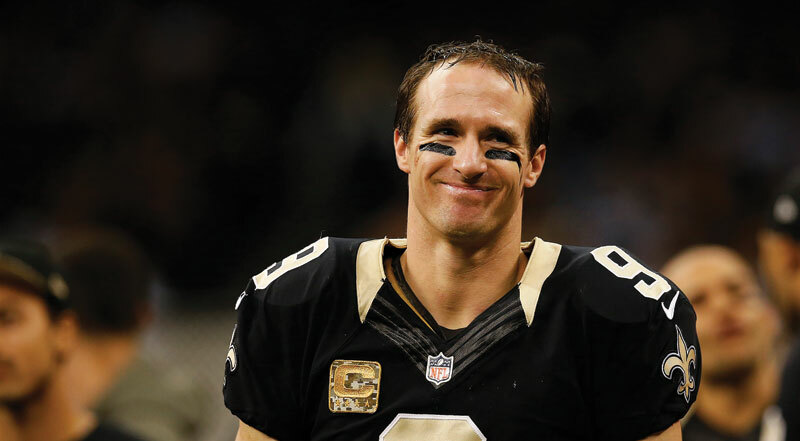 Our readers chose Drew Brees as New Orleanian of the Year|! !| New Orleanian I Admire Most (male) and Favorite Saints Player. The Must Attend Event of the Year! CLICK here to BUY your TICKETS NOW!!!! Later this new year readers will have a chance to vote on members of congress and, depending where they live, a mayor and council members. Our readers are already warmed up for the task having cast numerable ballots for their picks of the Tops of the Town. A self-addressed, postage-paid ballot was attached to our October issue. There was also an online ballot. Voting was heavier than ever with 927 ballots cast. In many categories, where the vote totals justified it, we narrowed the listings to the top three in each category allowing also, in many cases, for ties. Pretend it’s election night. The polls have closed and now it’s time to see the results. Go ahead and browse. And yes, all results have been sanctioned by the electoral college. Winners of a Jazz Brunch for two at The Court of Two Sisters are Bruce Schewe, New Orleans; and Dorinda Dorsey, New Orleans. In some ways Kermit Ruffins and Mitch Landrieu could exchange jobs. Landrieu is the mayor, but he once performed the role of Che in a local production of Evita, he can sing, and, if necessary, dance. Ruffins wouldn’t be happy tangoing with the city council, but his glowing personality would work well with the ceremonial part of the chief executive’s job. Both are relatively young. (Ruffins is 48; Landrieu is 53). Both are energetic. Both are very popular with our readers. In our Tops of the Town voting, Ruffins was an easy winner in the category of favorite local musician living in the city. Landrieu, an experienced vote-getter, captured first place as Favorite Politician and finished a respectable second in two other categories: New Orleanian of the Year and New Orleanian I Admire Most. Ruffins’ popularity comes not only from being a great musician but also from his easygoing persona. He is someone whose ambition isn’t so much to perform on the global stage but more to be barbecuing on the back of a pickup truck. Landrieu, who hales from an accomplished political family, has faced the difficult task of rebuilding the city yet has benefitted from the enthusiasm of a citizenry up to the challenge. He has made good strides toward reshaping the police department and is showing progress on his campaign pledge to rebuild the city’s once prestigious recreation department. There is nothing wrong with that, and with people like Kermit Ruffins and Mitch Landrieu behind the counter, there will be lots of fans waiting for a seat at the table. On that horrible weekend when locals evacuated the city as Hurricane Katrina churned, few among them had heard of Drew Brees. Fantasy Football geeks would know him as the quarterback for the San Diego Chargers via Purdue, but neither are teams that are much in the thoughts of locals. By the time those locals returned, circumstances and luck would’ve come into play and the little known quarterback was on his way to becoming one of the dominant figures during the city’s post-Katrina life. Brees is handsome, articulate, affable, smart and a great quarterback. Since the franchise was created in 1967, there have been many players to wear the black-and-gold, but few, other than Archie Manning, have become as much a part of the community as Brees. Rather than flying away after the season, Brees and his growing family live here and invest here. Life for quarterbacks can sometimes be as rough as a charging linebacker, but no one can ever take away that he was the Most Valuable Player when the Saints won what will assuredly be only their first Super Bowl. Our readers picked him as New Orleanian They Admired Most and (no contest here) Favorite Saints Player. Fortunately for New Orleans, he’s no fantasy – he’s real. One of the most famous restaurants in the city, Commander’s Palace sweeps Tops of the Town this year, receiving four first place awards, two second place awards and one third place award. Established in 1880 by Emile Commander, Commander’s Palace has been synonymous with New Orleans style and elegance for over a century. The Brennan family acquired the restaurant in 1969, and Commander’s Palace has continued to provide a long parade of not only exquisite dishes and service, but also a number of renowned chefs, including Food Network star Emeril Lagasse, Paul Prudhomme, Jamie Shannon and now Tory McPhail, soon celebrating his 12th anniversary as Commander’s Palace executive chef. Working in conjunction with local flavors and local suppliers, McPhail continues to amaze and delight guests with seasonal updates to the menu that includes successful recipes from decades ago. Commander’s Palace continues to appeal to a wide variety of diners, from their jazz brunch, cozy dinners and a two-course lunch featuring classic cocktails for 25 cents. In a modern world tailored to convenience, Commander’s Palace sticks firmly to its dress code, providing a unique opportunity for formal dining in a time where flip-flops have become business casual. Commander’s Palace continues to be recognized as haute creole cuisine worldwide, featured in publications such as TripAdvisor, Zagat, Food & Wine, Nation’s Restaurant News, Wine Enthusiast and more. Dat Dog appeared as a cash-only hot dog stand operating out of a shed on Freret Street post-Katrina, but since then, Dat Dog has exploded into two large locations on Freret and Magazine streets, a mobile Dat Dog Express and a new location on Frenchmen Street, tentatively slated to open before Mardi Gras. Hands-down voted the best hot dogs in the city, tourists and locals alike enjoy the wide variety of hot dog, bratwurst and sausage options in a laid-back, festive environment complete with projection screens for sports and colorful picnic tables. Featuring 17 kinds of hot dogs with upwards of 17 toppings, Dat Dog rotates its menu weekly, and offers seasonal and holiday items as well. Started by New Orleanian native Skip Murray, Dat Dog began in England as a hot dog cart called The Real American Hot Dog Company until Murray moved the operation to his hometown in Uptown. He then infused the menu with local flavors, with Creole and Cajun flairs to add a New Orleans twist to the classic American hot dog. Dat Dog also expanded its drink menu to include a wide variety of drinks, ice cream floats and a full bar with a large selection of beer and wines. Keeping ahead of the times with an active social media presence and entertaining hot dog blog, we can only expect more of the same deliciousness from this instant New Orleans icon. “Eat-Drink-Cheer!” is the motto of this year’s favorite sports bar, and what could be more appropriate? Located on Fulton Street in the Warehouse District as part of the Harrah’s Casino restaurant group, Saints legend Archie Manning’s restaurant excited guests since its opening in 2011. Serving an all-day menu seven days a week, Manning’s restaurant boasts more than 30 flat-screen televisions, including a 13-foot-by-7.5-foot mega-screen, a sports anchor desk, unique memorabilia from Louisiana’s first football family – the Mannings – and commissioned artwork by New Orleans artist Terrance Osborne. Although also available for private dining, Manning’s claims the city’s only “fan cave experience,” where guests can relax in a living room-like setting, while eating and watching the game. Manning’s also has a smokehouse called the Tailgate Experience, featuring a festival-esque environment where guests can drink, mingle and feast on a variety of meats smoked on a 12-foot smoker while a mega screen broadcasts the game. Dining highlights include the new traditional Southern Breakfast, Archie’s burger and a redfish courtbouillon. 3) Bay St. Louis, Miss.